On July 9 Courtney Best, 26, stepped outside the Papa Murphy's pizza in Corpus Christi, Texas, where she works, for a quick cigarette. Instead of her normal routine of going out back for a smoke, on this day she stepped out front, and the move may have saved a child's life. "I stepped outside, I was standing by the trash can, and I [saw] a white car pull up, and I just happen to take my phone with me, 'cause we don't look at our phones at work, and I looked down and I saw 'white Dodge Avenger Amber Alert,' and I was like, 'Nah, that's not him,' " Best told KRIS TV. The Amber Alert was for 7-year-old Nicolas Gomez, who had been abducted from Alice, Texas. 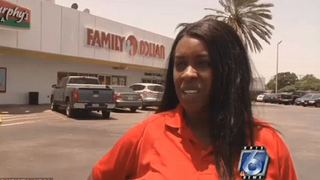 Best told the news station that she saw the man who was with the child, but still wasn't convinced that the person was the suspect. "The man was walking across the parking lot looking at me … 'cause I was the only person out here, with the little boy, and the little boy looked scared, and I was like, 'No, that’s not him,' " she said. Best immediately called the police and gave them the suspect's location; he was arrested and Nicolas was returned home. Best sheepishly admitted that she normally doesn't pay close attention to Amber Alerts when they come across her phone, but she vowed that she would pay super-close attention now. Read more at KRIS TV.